On January 3rd I started my quest to burn off the holiday fat I had gained over the holidays. 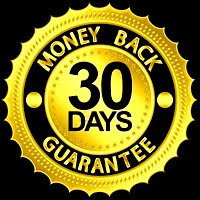 I wanted the fat off fast I wasn't in the mood to experiment with a fat burning plan that might or might not work, so I started on the Fat X Program. For this Fat X Project, my goal was to burn most of the fat I had gained over the holidays and to lose two inches off my belly area. Most people think that two inches is an impossible goal to lose off the belly area in 12 days. Most people just go about it the wrong way. 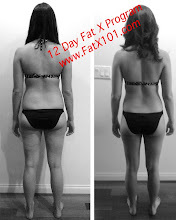 In my experience with the Fat X Program (FX 12), my clients experiences and messages I get from online users , two inches or more off the belly area is actually very doable if the FX 12 is followed properly. Half way through the FX 12 I knew I was on track. I took a measurement around my belly area and I was already and inch down. I've always found that getting results fast is very important for motivational purposes and it's one of the reasons I created the Fat X Program in such a way that you get fat burning results fast. That measurement at the half way point gave me the charge and motivation to stay disciplined with the diet and continue working hard on the fat burning workouts. 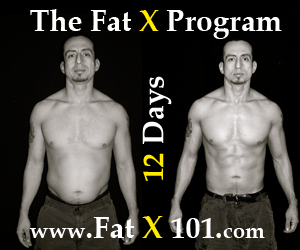 I completed the FX 12 and my Fat X Project for 2011 last Friday, January 14th. I took the final pictures Saturday Morning. I lost the two inches and actually probably could have lost more. I was entering a submission grappling tournament later that Saturday and actually began to eat more than usual the previous Thursday. All in all, I feel it was another successful run through the fat burning FX 12 and a successful Fat X Project for 2011. Stay tuned as later this week I will post my complete diet log for this Fat X Project. If you're in the Pasadena area, feel free to contact me for private coaching/training or to join my FX Boot Camp. Circuit training is an excellent way to improve your strength while improving cardiovascular endurance.